Music has been a part of my life in some form or another since I was young. Beginning as most do on descant recorder at primary school, I soon progressed onto the flute and also took up the piano. Throughout my childhood I worked through my graded exams with the Associated Board of Royal Schools of Music (ABRSM), achieving my grade 8 flute with distinction at age 15. For my grade 6 piano I earned the joint top mark in the Bristol area that year. I was also given the opportunity to play in some wonderful ensembles as a child. For ten years until age 18, I played with Yate Music Centre on a Saturday morning as part of their wind band. 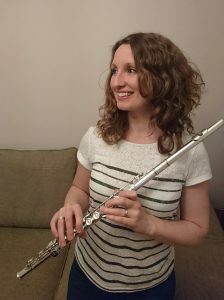 At the age of 12 I auditioned and earned a place in the National Childrens Wind Orchestra (NCWO) and as a teenager I auditioned and played principal flute in the West of England Schools Symphonic Wind Band (WESSWB). After completing my GCSEs and A Levels, I went onto study a joint honours degree in Music and Mathematics at the University of Birmingham. Whilst there I played in the University Symphony Orchestra and was privileged enough to play concerts in the Birmingham Symphony Hall. For my degree I specialised in composition. My final submission was to write a piece of music for the renowned Birmingham Contemporary Music Group (BCMG), which they played and recorded, a highlight of my time at university. I currently play in the highly respected Bristol Concert Wind Band. We rehearse weekly and play concerts regularly throughout the year. For any budding musicians out there, I cannot promote playing as part of an ensemble highly enough. It is a social and fun way to play your instrument, an opportunity to get to know a variety of music and styles whilst at the same time developing important instrumental skills. Aside from music I enjoy playing netball for a local Bristol club and I love to spend time at my home with my husband and two dogs.